Well, my turn to reveal the cards inspired by Joanne Wardle's cards in the October issue of Craft Stamper. Now these cards look deceptively simple. Anyone who has seen the way I work will know I favour my "everything but the kitchen sink approach", so this uncluttered style was bound to be a big challenge for me. All I knew for sure was that I wanted to do a Christmassy themed set of cards to make use of some of my under-used stamps. So, I approached this project with a little trepidation. Firstly I only tried to work directly onto a card blank once and mucked it up. After that I worked on a separate piece of card until I got it right. As a result I decided to matt and layer my cards. I tried masking with post its, but didn't get a result I was happy with, so I used round and oval nesties to cut masks that I positioned with masking tape. I was much happier with the rounded shapes somehow, especially as they seemed to let me build the depth of colour to give real definition at the edge of the inked panel, while leaving a glow in the centre. Once I had inked to my satisfaction, so obsessed was I to get the position of the overstamping right I even used my stamp positioner! 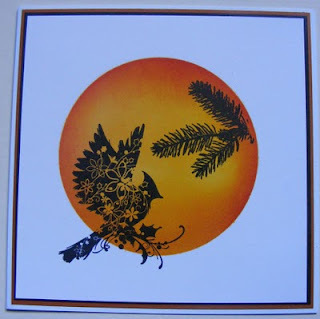 This first card used Sunshine Yellow, Peach Bellini, Butterscotch and Cranberry Adirondack dye inks and Wild Honey and Spiced Marmalade Distress Ink. I used Ranger Archival Black ink to overstamp all my designs. I used the Inkadinado Cardinal stamp - a gorgeous wood mounted stamp, that I use far too rarely and the Artifacts Pine Needles unmounted plate . 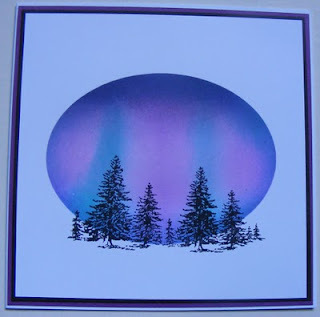 My second card reflects an ambition I have had for ages to produce an inked representation of the Northern Lights. This design, doesn't do what I really hoped to acheieve as the coloured lines are too uniform and not wavy enough. Never mind! I used Pink Sherbert and Raspberry Adirondack dye inks and Tumbled Glass and Dusty Concord Distress Ink. The stamp of trees is of unknown provenance, I bought it ages ago from an E Bay seller. Last but not least, I inked my final card using Pink Sherbert and Watermelon Adirondack dye inks and Spun Sugar and Worn Lipstick Distress Inks. I used the same mask as I had used for the cardinal stamps, so a little orange also found its way into this card. At first I nearly threw it away when I spotted this contamnation, but then I realised this added a little more warmth to the design. 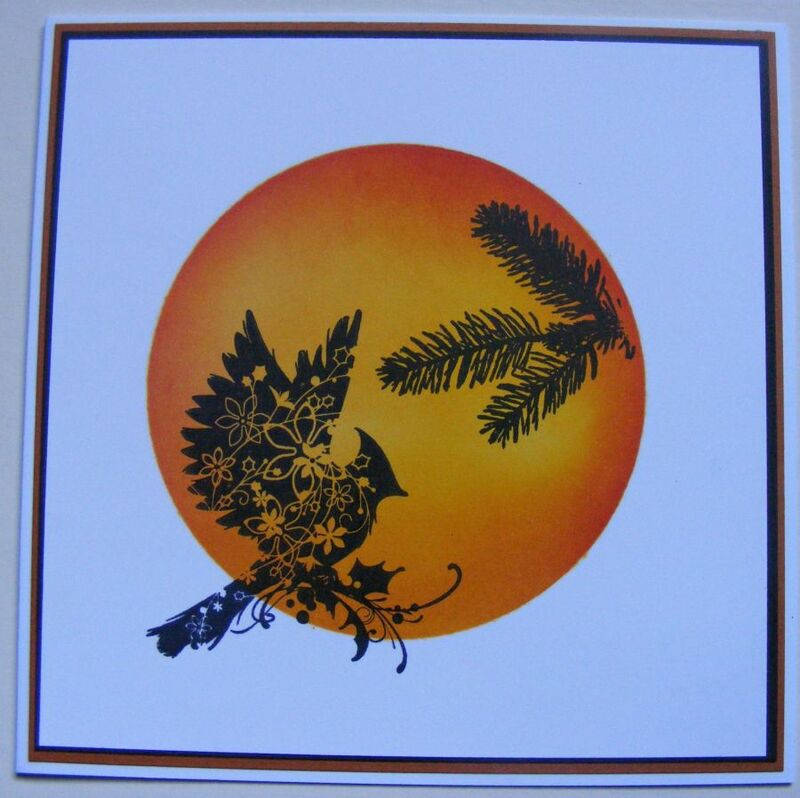 I used another branch from the same Artifacts Pine Needles plate as my first card, plus the flight of birds from the Tim Holtz clear Lost and Found set. 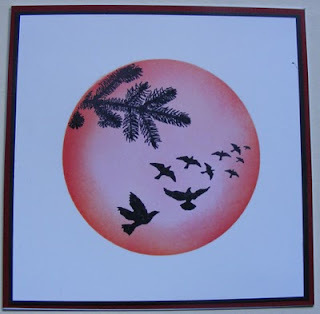 I have to say this was another purchase I made after seeing the very talented Paula use this stamp to great effect. I just hope she agrees imitation is the greatest form of flattery! I enjoyed making these cards. Thanks so much to Joanne for the inspitation. They certainly challenged me to work away from my normal style. I so wanted to stamp a Christmas sentiment in one corner, but managed to stop myself, at least until the photos had been taken. Thanks for poppng by. Sorry we have kept you waiting around this month. Life is pretty hectic for us all right now. These are beautiful and I know just what you mean about working outside the comfort zone. I'm sure it is good for us to do that from time to time and it has certainly worked well for you here. I'm also very wary of working directly onto cards when stamping and always mat and layer (chicken I suppose)!! Well done Elaine, this is a fabulous set of cards so you have risen well to the challenge of keeping if 'relatively' simple. I love the unknown trees image and you definitely have the colours right for the impression you wanted to give. Treescapes are a favourite of mine even though I don't get to use them often. All the images you have used are lovely though and definitely make beautiful Christmas cards. I think this type of card is brilliant to keep several handy and just pop a relevant sentiment on if you need one in a hurry. Wow!! these are all absolutely gorgeous. I love how you took my article and interpreted it. I'm honoured to have ispired these but the credit is all yours! What an impact these cards have! I had tried to avoid having to layer the masked design over the card as I thought it would detract from the simplicity of the card but yours are positively enhanced by the darker mat. Gorgeous shading and superb use of colour to make them really jump off the paper. I would never have thought of this technique for Christmas cards but you have proved it can work perfectly. Well done.